I've attached a newspaper article about the life story of a grand uncle of mine: Brigadier Gerald Vincent Moriarty (1894-1966). 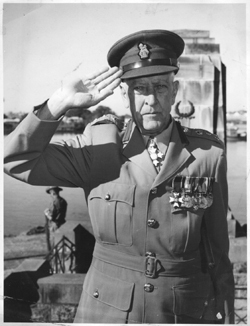 Although it focuses on his successful career with the Queensland Railways Department, a brief summary of his notable military record is also provided. 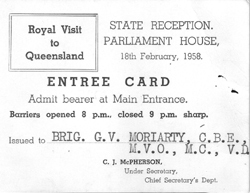 The second attachment was his entry card to the state reception for the Queen in 1958. 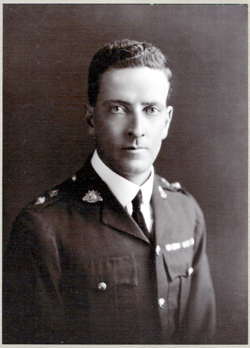 As you can see, he was a Commander of the British Empire (CBE), and a Member of the Victorian Order (MVO), in addition to having received the Military Cross (MC) for bravery in WWI. I've also attached three photos of Gerry. The first (main photo) was taken of him early in his military career, and the second is of him long after retirement. 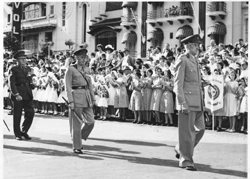 In the third one, he's leading the ANZAC Day march in Brisbane. Let me know if you'd like any further information about Gerry's life.